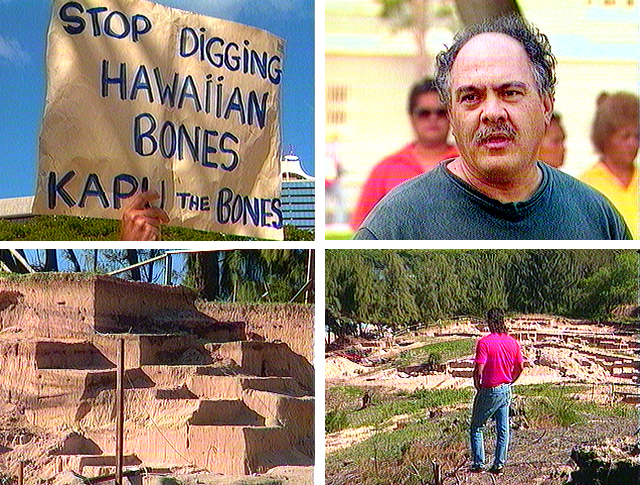 A few days before Christmas, 1988, a 24-hour vigil is held at the state capitol to protest the excavation of almost 900 ancient burials from the sands of Maui’s Honokahua bay by archeologists contracted to clear the area for construction of a new Ritz Carlton resort. The effort to stop the desecration is met with overwhelming support from the community and soon an agreement is reached between the state government and the developer to move the hotel site and reinter the bones. This collective action eventually resulted in legislation to repatriate ancestral remains from universities and museums throughout the world and protect burial sites throughout Hawai‘i.